(CNN) – Former President George W. Bush is recuperating well and is expected to leave the hospital Wednesday, after undergoing surgery Tuesday morning to insert a stent after a blockage was discovered in an artery. The blockage was detected Monday during Bush’s yearly physical. "Everything has gone perfectly, according to plan,” Bush spokesman Freddy Ford told CNN. “He is doing great and still on track to leave tomorrow." Former President Bill Clinton, who has had heart issues in the past, reached out to Bush upon learning that he had the stent procedure. Clinton is traveling in Africa with his daughter Chelsea, and advisers to both presidents said they were working on connecting the two men. Clinton had two stents placed in his heart in 2010 after images revealed that a bypass graft - part of a quadruple bypass surgery that Clinton underwent in 2004 - was blocked. 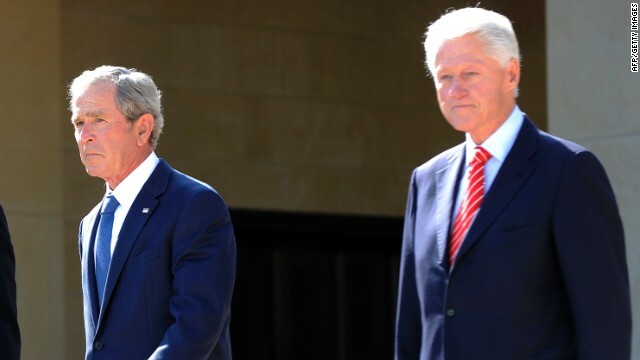 In April, Clinton attended the dedication of the George W. Bush Presidential Library and Museum and is close to the Bush family, particularly the patriarch, former President George H.W. Bush. President Barack Obama and former President Jimmy Carter joined Clinton and George H.W. Bush at the library dedication ceremony. Speaking aboard Air Force One Tuesday, White House Press Secretary Jay Carney said Obama "has been briefed informally on former President Bush's medical procedure and obviously wishes him well," but that he had not spoken to his predecessor directly. Bad president left, good president right! I hope President Bush is ok, even if he was the worst President in our history! great. that means we don't have to hear about the Midland Village Idiot any more. Buh bye Duh Duh Duh-bya. Best wishes on a speedy recovery. While I was never a fan of President Bush and his policies, I wish him good health and a speedy recovery.